Girls night? guys night? Date Night? Family treat? 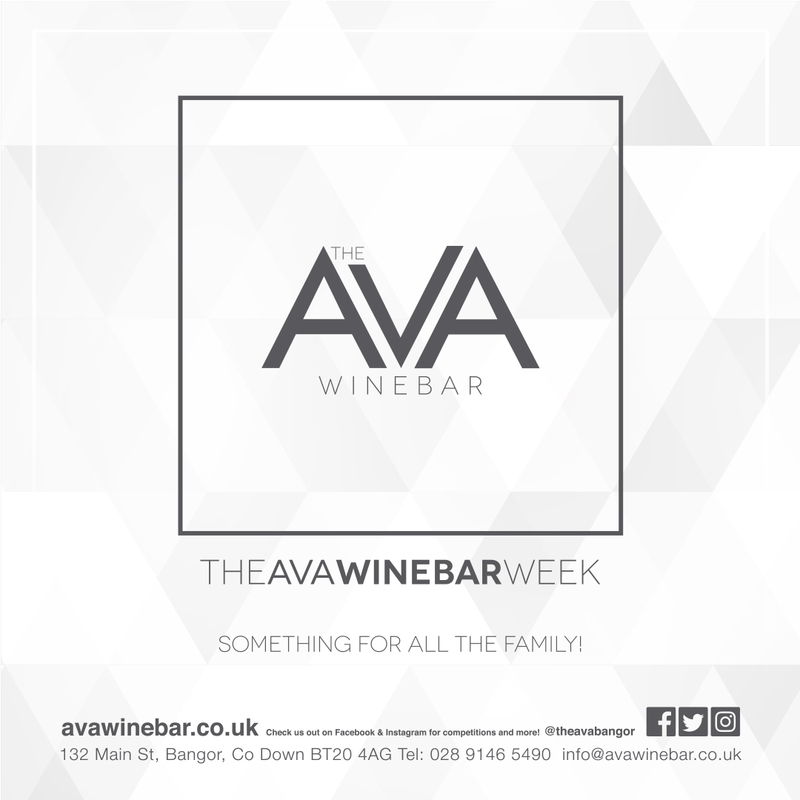 The AVA Winebar week has it covered! 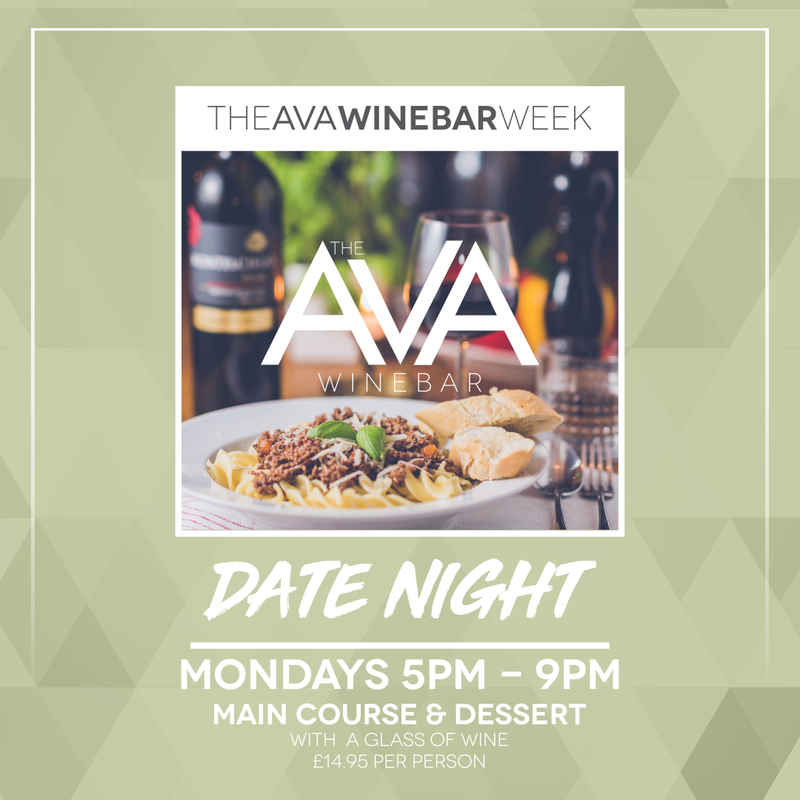 INTRODUCING OUR NEW MONDAY; date night! 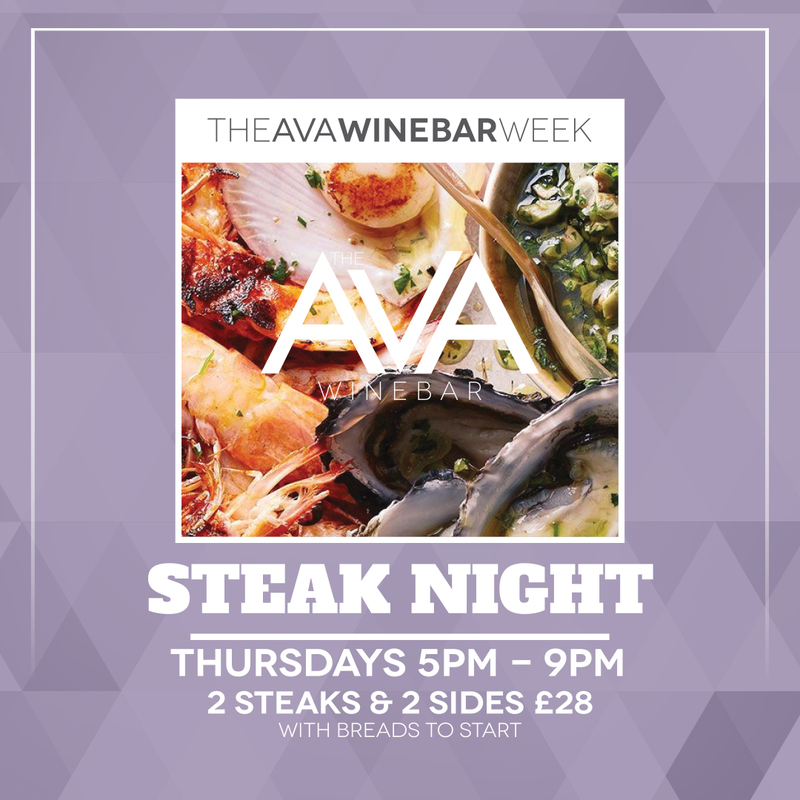 each week our chef’s will prepare a selection of 3 main dishes to choose from, you will also receive a complimentary dessert and glass of wine. this OFFER is AVAILABLE FROM 5-9PM every monday. the perfect mid week promotion for groups, families and couples. 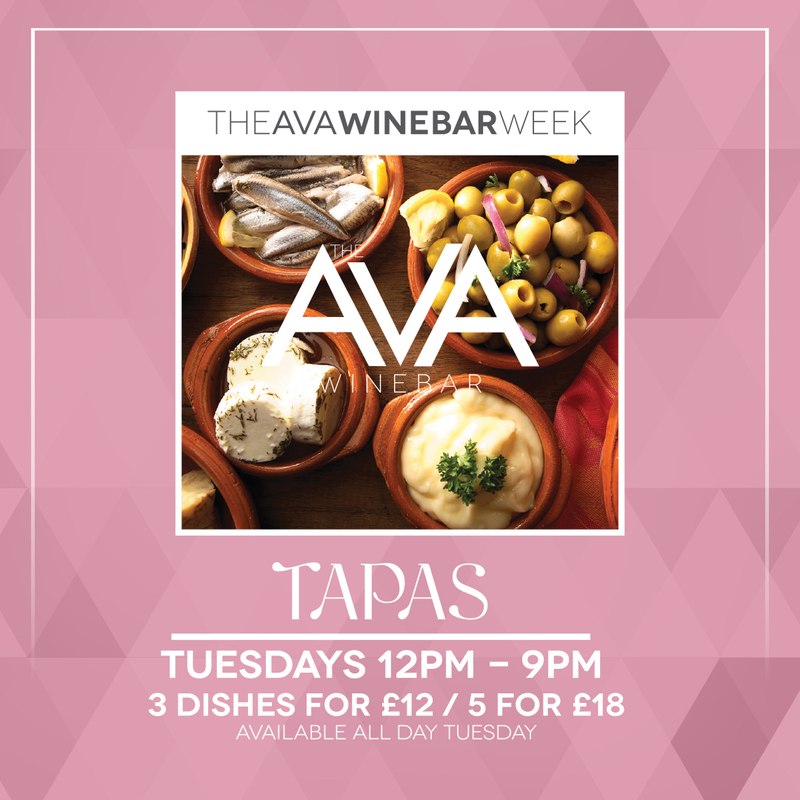 Enjoy 3 tapas DISHES for £12 or 5 for £18. Offer available all day 12-9pm. 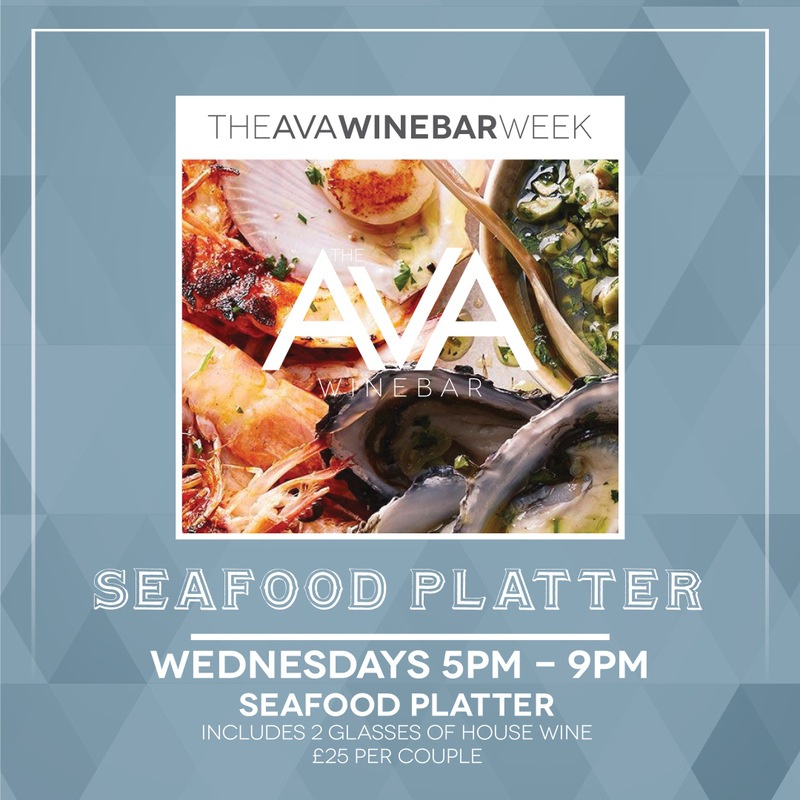 The winebar week favourite is back and it’s fresher than ever! our seafood platter changes weekly, please ask your server or check Facebook for a list of the ingredients. Pair with a glass of house wine just £25 for 2 people. to miss this night would be a missed steak! Enjoy breads to start, 2 sirloin steaks and 2 sides for £28 from 5-9pm. Eager to celebrate the weekend? Well we are too and what better way than with Happy Hour 10pm-1am. 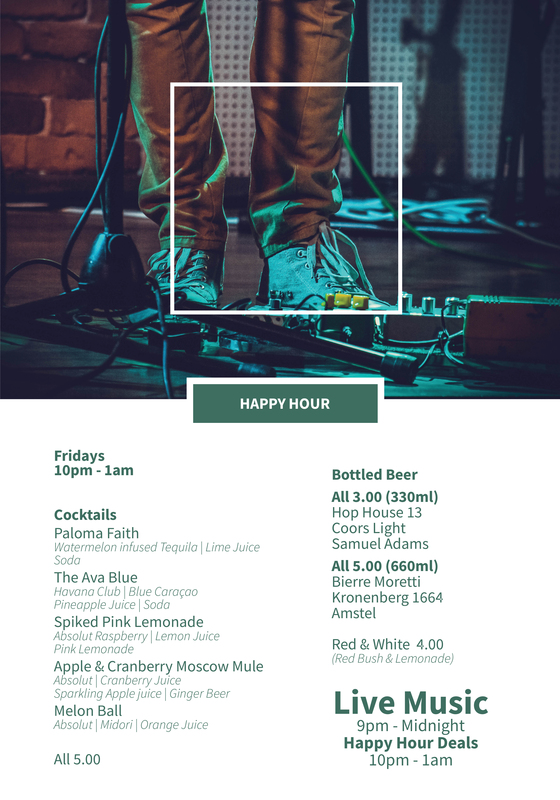 with the best of live, local music to provide the ultimate Friday night soundtrack from 9:30pm. 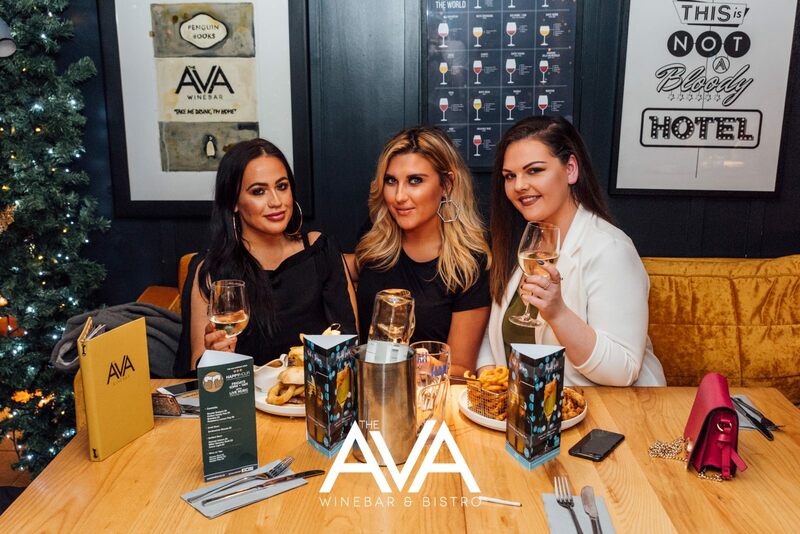 Start your weekend right with The Ava Winebar. 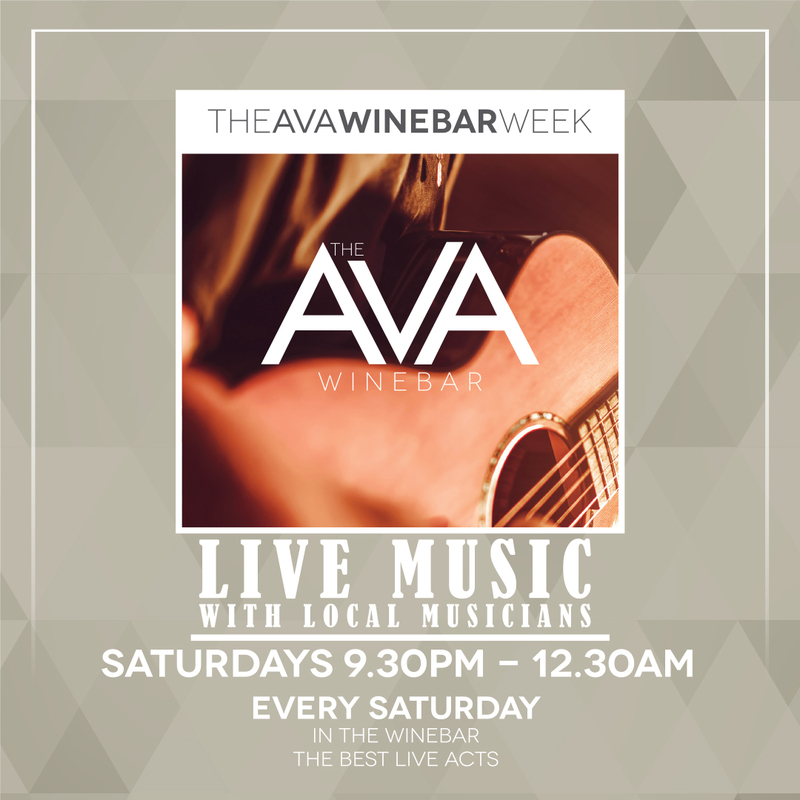 We are live in the winebar from 9:30pm-12:30am every Saturday night with acts such as cap on the wall,Mark Hamilton, cut n two and Swing Easy. 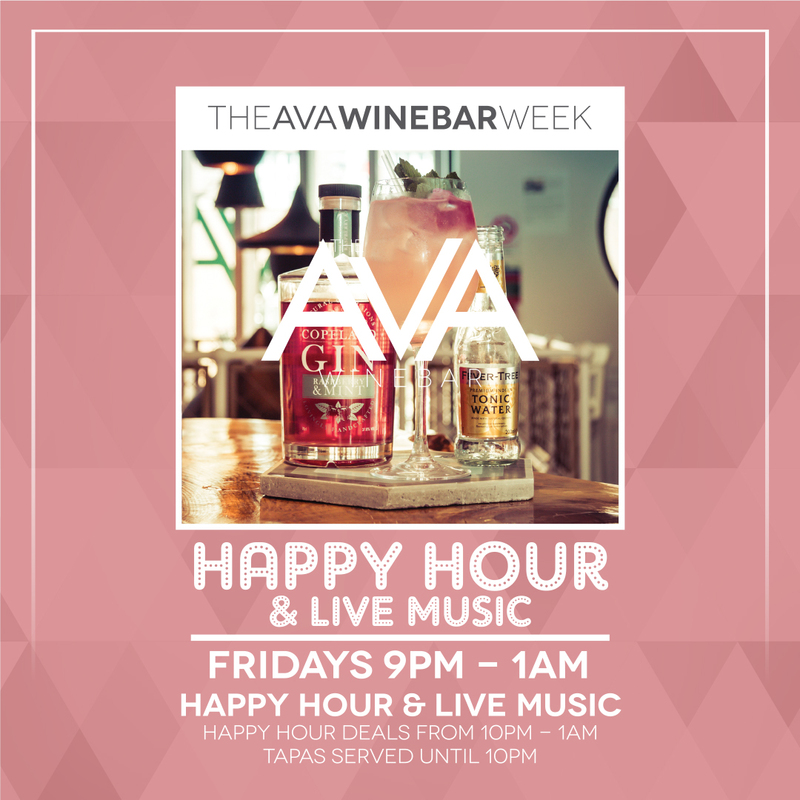 With late night entertainment, all day food menu served until 9pm and tapas served until 10pm, cocktails, gin and everything in between served until 1am, where else would you rather be? 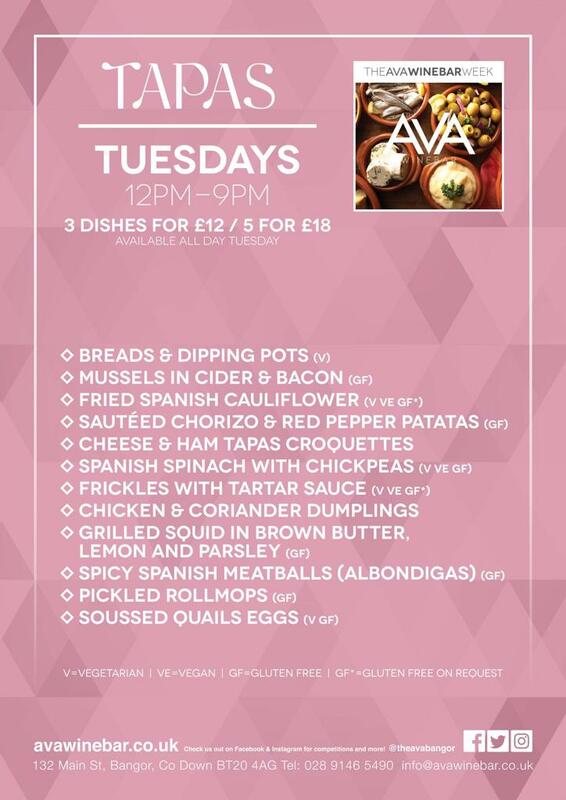 Sundays at The Ava can be easy like a Sunday morning! indulge in a 2 course Roast available all day from 12:30-7:30pm for just £11.95. Offer AVAIlable in the bistro & winebar! Live music in the winebar from 2-5pm.